Pioneers in the industry, we offer tikli cutting machine from India. Automatic Jewellery Diamond Faceting / Cutting Machine for Miracle Plates, Buttons, Medals, Coins, etc. 2 Controlled Axis. 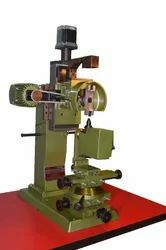 One Horizontal Head Diamond Cutter. Completely programmable. No Air Supply Required. Machine is Complete with Electrical and Electronic Plant, Optical Layer, Wire Cut 10 Collets (User Specifications), Service Belts & Spanners. Looking for Illusion Miracle Plates Faceting Machine ?